This is another quick stop to appreciate a job-well-done, a wonderful illustration for a largish catalog (12x9 inches) for Exide Electric Storage Battery Company (Philadelphia), which was printed in 1940. It would be simple to have a plain text cover for this sort of thing, being batteries and all, but Exide went the extra step and had designed for them this wonderful cover. It seems to transfer the reliance of their battery in the dark and cold environment via the working trains, their lights working, safe and secure. It is understated and very effective. From it a Cloud, (2). is made, and a white Mist, (3). Which being frozen, is Hail, (5). half frozen is Snow, (6). I've written earlier in this blog about the magnificent-ish and often described book by John Comenius called The Visible World...1, which also happens to be the first illustrated children's book. It was also a book about virtually anything, and everything, and certainly not a book about nothing, because sooner of later Comenius would get to the topic and deal with it, right or wrong. To entice witty children to it, that they may not conceit a torment to be in the school, but dainty/are., For it is apparent, that children (even from their infancy almost) are delighted with Pictures, and willingly please their eyes with these fights: And it will be very well worth the pains to have once brought it to pafs, that fcare-crows may be taken away out of Wifdom's Gardens..."
There's much much more to come in this book--just follow the link to the original at Project Gutenberg. 1. The work itself: John Amos Comenius, Orbis Senfualium Piélus: Omnium Principalium in Mundo Rerun/ &f m Vita АШопит, translated as Pictura et Nomenclatur, the Visible World, or A Nomenclature, and Pictures of all Chief Things that are int he World, translated into English by Charles Hoof...1726. This pamphlet was written in 1946 and is indeed a plea for help--mostly for food, and medical aid, for the displaced persons and survivors of WWII. It is a striking thing, blunt, necessary. The cover of the work does its job. There's nothing scary in that is there? The nightmare-maker may have its first introduction in the New England Primer, a book which was the backbone of North American education for many decades. as popular as it was and as much as it was used, print runs were not enormous, and most children would never actually own a copy of the book. It would be read to them for lessons, and that being the case much info was presented by vivid short rhymes , some of which are hard to forget because of the mental imagery they present. For example the mnemonic devices used to help learn the alphabet is riddled with murder, mayhem, vice, death, and not all that much hope....except if you include stuff like "Job feels the rod, and praises God" as a Puritanical form of hope/salvation. Perhaps the writers were after the indelible impression as well as searing the cerebellum with the moral code. In fact, in the 24-letter alphabet presented in the edition ("i" and "v" are not included), 12 of the letters are death- or violence-related, including the statements that we are all sinners, that cats kill things, dogs bite, fools are whipped at school, life runs out like sand in an hourglass, punishment deserves prayer, offensive things as big as armies can be swallowed up whole, a teary Rachel cries over her tiny dead child, time will kill you (again), kings will do and so will so, and youthful bits can of course kill you. It is part-and-parcel I guess of the rearing of kids in the not-necessarily-glorious history of childhood. Death and the possibilities of it or some close relative of it was a lot closer to reality than it is today, especially when the average life span at the time was well under 50 and infant mortality easily an order of magnitude more prevalent than it is today1. And of course outside of the plague-of-death culture and the subjugation of kids for a better behavior there was also the screaming Calvinist theology that beat up/taught readers the abandonment of the self to the creator available to young and old. This sort of indoctrination was hardly limited to the New England Primer, printed in this country as the first of its type beginning in the late 17th century (and with some familiarity several printings can be remember for famously having the "printed by B. Franklin" imprint in the 1760's). It would be easier to name the child's instructional that did not have this leaning (at least before 1880) though I am presently hard-pressed to think of an example off-hand). And lest we forget, the Grimm brothers wrote stuff for kid the vast majority of which we wouldn't think of reading to our kids today--I didn't. 1. Good national statistics for the U.S. before 1870 begin to get sketchy in this area, though from 1900 onward the numbers look pretty good. Suffice to say that historians of medicine and Medieivalists and so on make pretty good educated estimates for these rates, and they're not so good. For example, in 1900 in America the average life span was 47 and the infant mortality at 16% (compared to about 80 or so and .7% today), though I cannot offhand find the stats for childhood survivability by age 10. Looking back in time the numbers get really big, with some people saying that childbirth mortality in the Medieval and Renaissance times were in the 30-50% range, and the survivability rate passed 10 was about the same. I don't have these rates for American colonial times, but I assume that they are closer to the Renaissance than they are to 1900 numbers. And of course this does not apply to slaves, whose rates of survivability were smaller still. I bumped in this issue of Nature (volume 106, pp782–784) this evening, and as it turns out it is the "Special Number: Relativity" and published February 17, 1921--and it is packed. Somehow when I first looked at this weekly I mega-missed the Einstein entry--as is customary I work back-to-front, bottom-to-top (don't ask) and was so taken by the collection of Big Names that Einstein's escaped me. Einstein's article is longish for this journal and concise, with numerous references in the influencing forces in his development of the theory of relativity (which he capitalizes). The table of contents for this single week--though it is (roughly) a double issue of thirty pages or so--incoudes work by Cunningham, Frank Dyson, James Jeans, H.A. Lorentz, Oliver Lodge, Herman Weyl, A.S. Eddington, Norman Campbell, and Harold Jeffreys, plus a few pages of tight bibliography. There is something attractive in presenting the evolution of a sequence of ideas in as brief a form as possible, and yet with a completeness sufficient to preserve throughout the continuity of development. We shall endeavour to do this for the Theory of Relativity, and to show that the whole ascent is composed of small, almost self-evident steps of thought. The entire development starts off from, and is dominated by, the idea of Faraday and Maxwell, according to which all physical processes involve a continuity of action (as opposed to action at a distance), or, in the language of mathematics, they are expressed by partial differential equations. Maxwell succeeded in doing this for electro-magnetic processes in bodies at rest by means of the conception of the magnetic effect of the vacuum-displacement-current, together with the postulate of the identity of the nature of electro-dynamic fields produced by induction, and the electro-static field. This pamphlet certainty has entry to the evocative Fantastic and Improbable Pamphlet Covers Collection, though I was a little stumped by not being able to make it reveal itself to me with a short effort. It was written by J. Kmicic and from what I can see was probably published during WWII, though there is no publishing information and nothing in the text to hang a firm date on. (There is a periodicals reception stamp in it from November 1946 fro the periodicals division of the Library of Congress, but that doesn't mean it was accessed right after publication, though it does put a limit to how old it isn't.) As it turns out the keys to WWIV is Poland. That a very strong and heavily armed Poland would be the cornerstone of a defense of the West in the East, that the further the extent of a strong Polish eastern border reached the greater the play "of our Western culture will extend". Kmicic makes the case that it if Poland were stronger then it could have resisted Napoleon (evidently WWI), and the Kaiser (making WWI into WWII) and Hitler (WWII=WWIII). The WWIV part is murkier because there isn't a clue so far as I can tell that the author knew what happened to Poland when the Nazis fell and the Soviets moved in. Had that been the case, the call for having a strong and unified Poland would probably not have been played so heavily. A "Mighty Poland", Kmicic writes, means "freedom for all smaller nations of Europe" and therefore "the impossibility of world war". There are a few things that I've missed no doubt in my speed-read, but I was just after the cover, anyway. Hitler and Company tied to sell the idea of an aggressive Polish nation, that the attack launched on 3 September 1939 was a preventative measure to stop the advance and attack of Poland against Germany. Not too many people believed it--at least outside of Germany--but Hitler tried it out, anyway. And why not? When most of everything he said was grounded in The Big Lie, why not pile it on? The great the untruth, the more impossible it is, and the ore you say that you believe it to be the case, the more of a possibility exists for others to believe it, too--because who in their right mind would say something so insane about something else that is equally unbelievable? Therefore, the insane statement much be so. That's part of The Big Lie. 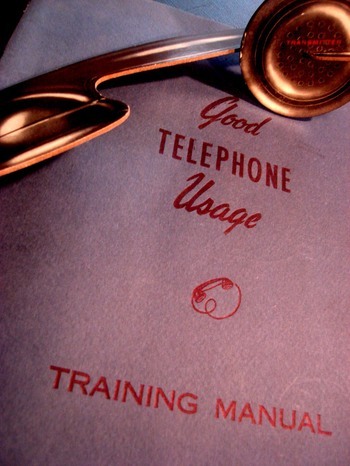 Yes, this elegant, oversized, well written 1946 pamphlet explains in fabulous and excruciating detail how to use the telephone--and it does indeed come with a two-part heavy paper telephone receiver for the reader's practice. It is packaged in an envelope in the back of the pamphlet with a large drawing explaining how to put the two pieces together. The work is just so fulsome, wholesome, forthright, exacting and thorough that it just makes the casual reader stop in their tracks to applaud the effort of explanaion. For example, it isn't until page 13 that we get to pick up the receiver (and listen for the dial tone). 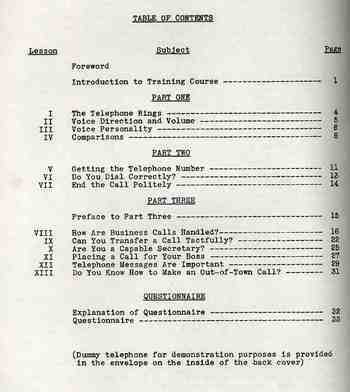 I've reproduced some of the table of contents to give an idea of the extent of the telephone usage. What brings this so close to being from out of the science fiction past is that the booklet is ten years older than your narrator. Atanasoff's ABC, Bell Labs Mark II, Bletchley's Colossus, and Harvard's Mark I machines existed, television was begnning to explode and half-doom radio for all time, and telephones were on their semi-last-leg of exploding their way into more American homes and businesses. But somehow, here on the verge of the greatest electrical revolution in history, we were getting instructions on how to pick up the telephone. 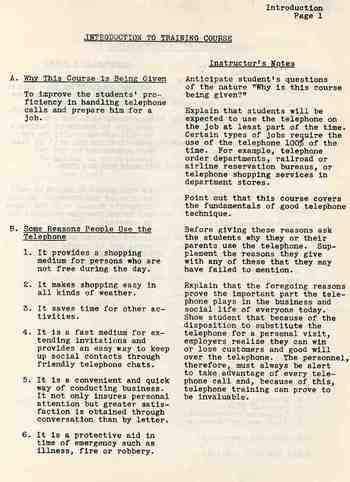 But I'm really not complaining here, not at all--its just the nexus of the "how to listen for a dial tone" and the coming of the ENIAC one year after this pamphlet is published that is so startling. Even so, this instructional is more complete and (of course) better written than any of the computer manuals that came with any of the machines that I've purchase in the last 30 years. It is a thing of great and supra-obvious beauty. This is another example of a small job done Very Correctly. I found this arresting map in a tiny publication called ...Sans Condition, which was published in the first half of 1943. 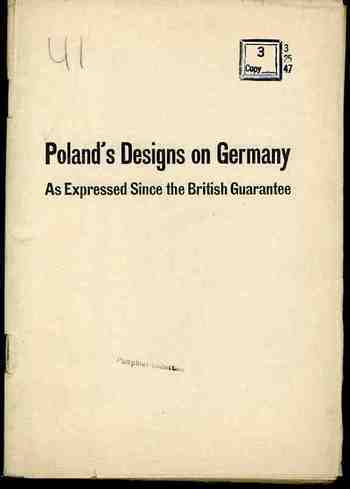 The publication is only 12 pages long but has a number of evocative images of Germany being bombed and lines of German POWs, in general a propaganda piece for French-speaking folk (which was printed god-knows-where) produced deep in the war and at a time when the tide has about turned on the Nazi regime. The title of this post is the title of the map, "Ils ont decide ou, quand et comment les Allies lanceront leurs attacques"--and you don't need to know French to know what it says. 1 Over 1 & the "Rule for All Time Past and Future"
That is a provocative title, or chapter heading, but that's how it appears in a pamphlet I'm reading right now, a juicy thing that can lead to a memory palace of ideas...until you start reading the para below the head, when things get both more crystalline and fuzzy. What Mr. Henderson is getting at is a calculator for reducing a date to find out the day of the week a particular date falls on, from the 1st century to the 99th. On the back cover of this pamphlet he provides a tickler for this enumerating device, which is explained in another publication (Henderson's United States Unity and Decimal Method of Calculating). This is the very striking cover design for a pamphlet written by Dr. Julius Klein (the assistant secretary of commerce) produced by the Institute of Makers of Explosives (103 Park Avenue, NYC, who of course made a large play for blowing stuff up as a positive driving force in the history of civilization. And they are right in many cases, obviously, but the images and title taken out of context are very provocative. Dr. Klein starts off by disabusing the reader of the “bad press” of explosives: “a good many of us, I imagine, labor under a misapprehension about the explosives industry…we conceive of explosives as an instrumentality of havoc. But that conception is utterly wrong.” Utterly? The man does have a point of course, which he explains in subject headings like “Dynamite the Liberator”, “Many Unusual Uses”and “Explosives Release Raw Materials” But “utterly”? Its a real piece of heavily worked propaganda that makes the case for the economics goodnesses and misunderstood destructive values of TNT. Between 17 February and 15 March 1913 there occurred in the huge building at Lex between 25th and 26th streets in NYC--the monumental International Exhibition of Modern Art at the armory of the Sixty-Ninth Regiment, the Fighting 69th (so called by Robert E. Lee), the "Fighting Irish", the famous Armory Show, the Armory Show. This was the first large public exhibition of modern art in America, and even though the 69th regiment had seen five wars (at least, so far as I can tell), the armory itself hadn't really seen one, until 1913, when battle lines were drawn among the Cubists and within and without the confines of the modern" part of modern art, the sensitive honor of the nature of art laid bare. "Total Sales: $44,148 ($30,491 for works by European Artists, $13,675 for works by American artists." ...which I found extraordinary. Even using the Bureau of Labor Statistic's CPI calculator this figure gets bumped up to the buying power of somewhat more than $1,000,000 in 2014 dollars, it is still incredibly shy of anything approaching any aspect of the financials of the art world. Here was the greatest collection of artists (perhaps?) of modern times under one roof with their works offered for sale for nearly a month and only $44,000 was generated, with only a third of that going to American artists. And then when you consider that some 1600 pieces of art were exhibited, it leads me to the conclusion based on these bits of data that not all that much was sold at the monster show. Now of course $44,000 was a lot of money in 1913, though it was still not very much money at all actually spent in a creative/explorative/appreciative manner. The total was about 100 times the average salary of an American worker (about 400/year). TO put things in perspective, the total sales at the show in terms of 100 times the average American yearly income would be about $5,000,000 which is still a tiny percentage of what the enormous sum could be had these pieces of art been for sale in 2014. In short, really, the difference in the numbers is so vast that they are almost without meaning sop far as comparison goes between 1913 and today. That said, I still find it extraordinary. By the way, Duchamp sold four pieces for a total of $972, according to Mr. Watson. Just a quick comment here about Matila Ghyka's The Geometry of Art and Life, published by Sheed and Ward in 1946. It is a beautifully-designed book, skinny even though it is 176pp (not long not short), and well and interestingly illustrated. It addresses math and art, or math in art, finding recurrent spatial proportions there, and in music, with the maths being at the center of the creative and imaginative process. The author goes further and dips into these themes in life/biology (that's the "Geometry of Life" part), where he trods in familiar antique and old grounds of the Golden Section of logarithmic spirals, and then finds himself in a very interesting position in chapter VII's "The Transmission of Geometrical Symbols and Plans". I'm not so sure that I like the book as a complete work, but the parts make for some very good reading. Finding the hard-to-find, the invisible, the "hidden", is an essential aspect of, well, mostly everything. Whether it is Newton separating light with a prism to find its constituents, or Hooke investigating the formerly quasi-real microscopical world to reveal worlds within worlds, or Galileo using his telescope to quash the ideas of the unaided-eye-visible night sky as an unaltering perfection of creation, or Roentgen seeing through his wife's skin, or Fraunhoefer finding the complex spectrum, or Henry Draper determining a chemical constituent of the sun, or the invention of the zero or negative numbers or subtraction, of finding Black Holes or other planets or the remnants of the Big Bang, or (Kandinsky) finding the nonrepresentational aspect of art, or Duchamp finding in an upturned urinal that art had no boundaries...the list goes on and on. One aspect of this "finding something in nothing" business that is interesting to look at because it is so local and discernible--and recent--is in air navigation and detection. And I'll do this using a series of excellent illustrations from The Illustrated London News, all of which are from the 1927-1938 period. The first is relatively simple, at least simple from here in the year 2014, which shows four pilots being briefed on weather conditions with a aerial chart for conditions along intercontinental routes. The placement of these symbols represented a vast improvement over the earlier systems of readying pilots for what weather lay ahead, if indeed there were any communications at all. This represents an early look at a codification of conditions and expectations for air travelers--a display of new and important data in 1927. Next is a brilliant device for assisting pilots to land in foggy and dark conditions--actually on how to find the ground safely. In 1927 (again) a RADAR-like system was put into place on aircraft that involved receiving the signals of an ac-pulsed buried electrical cable that surrounded an airport. The receiver (seen here on the flight panel of the pilot in an open-air cockpit) would be read to reveal proximity of the airport, the pilot making wider and then closer spirals in descent until his was basically within the buried airport cables and thus able to land. Prior to WWII RADAR1 was somewhat functional but still in development, and as we see in this set of 16 July 1938 illustrations, the key methods for finding enemy aircraft at night (in order to shoot it down of course) was an audio-visual method, using "sound-locators" to find the approaching bombers and then spotlights to illuminate and track them to their destruction. These images represent some idea of the state of the art of being able to find things--like the ground at night or approaching enemy aircraft--in the 1927-1938 period, all of which would be drastically changed in just the next two years. Whipping ahead into WWII a very significant "battle of the beams" began between the U.K. and Germany, especially during the Battle of Britain, involving countermeasures, espionage, propaganda and false-positives in regards to the use and development of radio-based tracking and detection--the U.K. particularly making use of this technology in a wide-spread air defense system. But it was in the United States in 1940 (and really by the U.S. Navy) that RADAR got its name (for RAdio Detection And Ranging) as well as its great impetus for development and deployment.